Learn the true sources of your conversions with Piwik PRO conversion attribution reports. How can Piwik PRO conversion attribution help me? Piwik PRO conversion attribution modelling will help you answer the most important questions about how your marketing channels work together to create conversions. Learn what role website referrals, searches, and ads played in conversions and how to attribute conversions to marketing channels. Compare attribution models and see which marketing channels generate direct and assisted conversions. Predefined attribution models give the whole picture. Use custom attribution models for the best insights into to your marketing mix and customer journey. Attribute conversions based on your unique needs. Use attribution modeling reports to optimize your marketing spend. Compare different models and make smart decisions where to invest your budget. Customize your marketing channels based on source, medium, campaign names and other referral parameters to get even deeper insights. What are the benefits of using Piwik PRO conversion attribution reporting? No digital channel operates in a vacuum. Evaluation of channels and campaigns using last-click conversions provides incomplete results. You need an attribution model that accurately measures a display’s contribution in order to determine its real value. Display delivers better results for “assisted” conversions, while search drives last-click conversions. Channels providing “assisted” conversions show up somewhere in the customer’s purchase path, but they aren’t always the last encounter the customer has with your brand before buying. One channel gets consumers down the purchase funnel (e.g. display), another closes the sale (e.g. search). Attribution modeling stops you from fixing things that aren’t broken. It also helps you focus on optimizations which produce real results. Changes in performance should be viewed through the lens of interactions in your broader digital marketing portfolio before taking action. 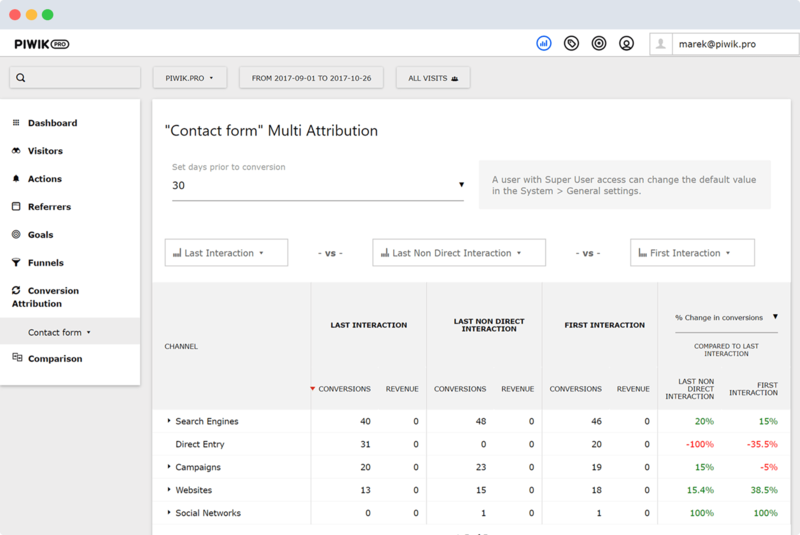 To optimize for greater impact on your overall performance, review diverse combinations of multiple marketing channels in conversion path reports. A comprehensive optimization strategy can boost performance and save you time. An accurate evaluation of first- and last-click conversions along with consumer purchase paths gives you a real idea of the consumer experience. Use data showing that paths including exposure in both display and search make up a large portion of your conversions to adapt your messaging to consumer behavior. Get in contact with our sales team and learn more about Conversion Attribution in Piwik PRO!